Westwater overlook - Little Dolores area. Note the number of different geologic layers exposed. 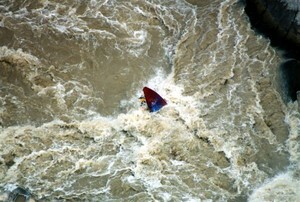 Overhead view - the thunderous hole at Skull Rapid prevents kayer from escaping the Room of Doom at medium and high water.